As I write this, it is cold outside. It is very cold, so a winter ale (or Christmas ale) should hit the spot just right. 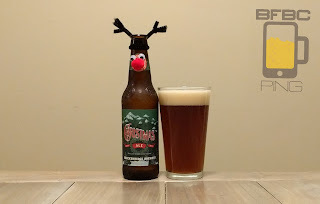 This is the latest in my series of reindeer-themed pack from my brother who is in or about Cincinnati and gifted me with a bunch of beers from the area. Even though this is a "Fine Colorado Ale," it is from the... big turnip? Rust City? I don't know it's nickname. The slightly murky beer is a dark brown with red highlights. The stalwart head is leaving a good amount of lacing as it goes down to a fluffy little pillow that looks all sloshed to one side of the glass, but there's enough of this... slanket? to spread around the rest of the top. The aroma is heavy malt and those traditional winter spices. First sip follows the nose almost exactly, but it is a lot more gentle than expected. So, we have the sweet malt with its toasted caramel and the spices like ginger and cinnamon all nestled in there like they were waiting by the fire on a winter night. The sip is just about right - maybe a twinge of bitter in the end, but isn't there always a bitter end to the evening? Tip-in is significant carbonation burn with the toasted caramel malt and relaxed spices. The middle is heightened carbonation burn with a rise of spices and a bright spot of pine hops. The finish is sweetness as everything dies down, but then a surge of bitterness and spices sparkle as the whole thing retards. Bottom Line: More like a spiced brown ale from the taste, bur this is a good one for a cold winter's night.